Choosing Love: Discover How to Connect to the Universal Power of Love -- and Live a Full, Fearless, and Authentic Life! From Fearful Living to Fearless Loving! Are you ready to see love in a whole new light, let go of your deepest fears and everyday stresses, and experience real joy and abundance? Choosing Love redefines the way you perceive love and teaches you how to connect with yourself-and others-in ways you've never imagined. 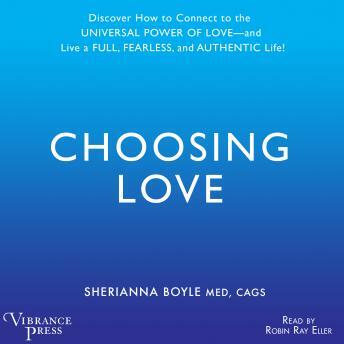 Using her years of expertise as a psychologist, professor, and energy healer, Sherianna Boyle guides you through each step of your journey with details on setting an intention to choose love, breaking free from fear and self-limiting beliefs, and tapping deep within yourself to access the love that's already there. Each page offers groundbreaking techniques for nurturing love's vibrations and releasing anything that no longer serves you. Complete with exercises and mediations to further open up your heart, Choosing Love will show you how to heal from past experiences, empower your inner voice, and manifest a full and fearless life.